YotaPhone 2 has already started winning hearts of gadget lovers across the world. With its AMOLED display and E Ink feature on the rear side, it is quite successful in the tech world. In a very short span of time it has come to the position of leading selling devices because of its dual screen design. Inspired by this the company has launched a White version of the device last day. They have also declared a price drop for the new model from that of the older one. Again the company surprised all the existing users with an update to its Android version. All the YotaPhone 2 users can now update their handset to Android Lollipop 5.0 at free of cost. Another great news is that new White version will have a lot of special features that will allow users to explore more things with the help of E Ink display. Only the rear panel and sides has been changed in the new model. The front panel remains black. It is so because, black would be comfort for eyes when display comes in AMOLED. Another reason for continuing with front panel in black is that they do not want risk the sales of the handset by making drastic changes to the existing one. Along with the change made to rear panel and sides of the handset, certain other parts also got renovated. The Volume Key and the Power Key got a metallic colour. In the earlier model the primary cam and logo on E Ink side was white in colour, which is now turned into silver in the White version. With these small physical changes, the new version is more elegant in looks. But the white plastic is vulnerable to get busted easier than the black panels. The European markets are the luckiest to have the renovated handsets of YotaPhone. They will be getting the White version with Lollipop update and in a cheaper price when the previous model is concerned. Both the White as well as the Black variants is available in UK markets for about £440 which is £115 less than the launch price. In other markets across Europe it would cost nearly €599 which is €100 less than the launch price. The white version is also available in certain Middle Eastern markets as well as in CIS markets at full price as Black and soon it is expected to cut down the prices in these markets too. By the month of July, an Indiegogo campaign will be organized in North America inorder to facilitate its launch there. Along with physical changes, YotaPhone has been focusing on making changes over its software. One such upgradation that is already made available in Black version is the White Theme for E Ink display. 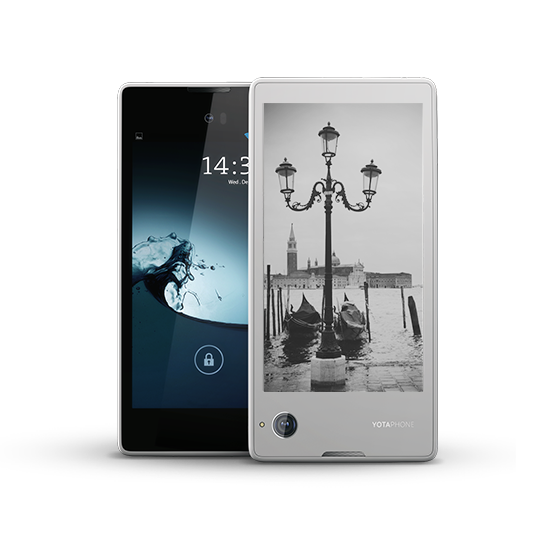 It is an inverted version of YotaPanel User Interface that runs on E Ink rear side and gives an impression that the white becomes black and black becomes white. It was made so inorder to give a natural look to White version of the gadget. YotaPhone 2 is now upgraded to Lollipop 5.0. The White version already has the upgraded version. But the Black version will receive the update shortly. It may take a maximum of 10 days to get the update over your Black YotaPhone 2. Even though Google provides for the upgradation of their user interface, Yota also takes immense care to renovate their software that functions on E Ink Side of the handset. The custom made softwares that the company provides namely YotaCover for the front panel and YotaPanels which has the collection of widgets. YotaCover is a type of screenlock with the background providing images that are provided by the user and also provides notifications that remain unread if you permit them. The advantage is that you can switch over between YotaCover and YotaPanel user interface with the help of on-screen key. Now the YotaCover and YotaPanel are provided on the same panel which will be available by swiping between them and now the On-Screen key becomes the Home Button. This enables the user to select either Panel or Cover from E Ink Home Screen. Establishing YotaCover is quite simple in the new application of YotaHub. YotaHub application is used to manage certain things in the E Ink side of the handset. YotaCover can grab images from various social media networks like Facebook, Google+ and Instagram and alter them whenever you want to do so. Earlier it was just a hectic job. First of all you have to handpick an appropriate service and then you have to select the appropriate image. Now these steps are being eliminated and you are able to select the needed image from the gallery with a single tap. YotaCover has got another feature called YotaRemote. It is a smart television remote that functions purely on WiFi. It is compatible over new Samsung and LG televisions. Another application is YotaFit, which is actually a pedometer application. YotaPanel also has certain additional widgets. Among them the most notable one is the Gmail Widget. Another upgradation is the integration of YotaSports which is powered by EuroSports. This will provide updated information about various matches along with their live scores and so on. YotaNotes helps in listing down certain things which can be easily synced to Google Drive. A very special upgradation is the Yotagram. It integrates Telegram application with E Ink widget. Bookmate provides subscription to e-book services provided and enable the user to have access to world famous literatures available in digital format. YotaEnergy is an application that prompts you when the battery is low. It also helps in providing information to its users regarding the time upto which the handset remains live with or without battery saving mode enabled. The latest news that came out was regarding the wireless powerbank from Yota. It is a remodeled one with white label. The powerbank is a portable charging gadget with in-built Qi wireless charging plate. It is available across the markets of UK for nearly £35 and it may cost €49 for rest of the European markets. This accessory will definitely help to juice up the handset when the power is get exhausted with usage.